Edited by Suman Kapur and Maristela Barbosa Portela . A need for a book on immunology which primarily focuses on the needs of medical and clinical research students was recognized. This book is relatively short and contains topics considered relevant to the understanding of human immune system and its role in health and diseases. Immunology is the study of our protection from foreign macromolecules or invading organisms and our responses to them. These invaders include viruses, bacteria, protozoa or even larger parasites. Certain individuals develop immune responses against their proteins (and other selfmolecules) in autoimmunity and against our own aberrant cells as in tumor immunity. Adaptive immune responses (it takes them days to respond to a primary invasion) such as infection by any pathogen, lead to production of antibodies and cell-mediated responses which recognize foreign pathogens and destroy them as a function of specific immune cell types. The response to a second round of infection is often more rapid than to the primary infection because of the activation of memory B and T cells. These responses are mediated by signals such as lymphokines, cytokines and chemokines produced by various cells and these in turn stimulate cells of the immune system. When an infection occurs, immune cells flock to the area and secrete large amounts of highly reactive chemicals to combat the invader. But, these inflammatory chemicals also attack normal tissue surrounding the infection and damage critical components of cells, including DNA. During chronic inflammation, DNA damage may lead to mutations or cell death and even to cancer and other diseases. Thus this chronic, and "systemic inflammation," is presently being linked to almost everything from heart disease and diabetes to Alzheimer’s and arthritis, and may even be the cause of many other chronic diseases. Nobody knows whether this inflammation is a cause or consequence of chronic disease/s —or perhaps something that just goes along with these conditions. With the growing incidence of chronic human diseases, the role of chronic inflammation and consequently “Therapeutic Immune-suppression” has been getting a lot of attention lately. Immunosuppression involves an act that reduces the activation or efficacy of the immune system. 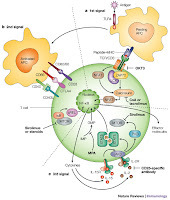 Some portions of the immune system itself have immunosuppressive effects on other parts of the immune system, and immunosuppression may occur as an adverse reaction to treatment of other conditions. Deliberately induced immunosuppression is generally done to prevent the body from rejecting an organ transplant, treating graft-versus-host disease after a bone marrow transplant, or for the treatment of auto-immune diseases such as rheumatoid arthritis or Crohn's disease. A person who is undergoing immunosuppression, or whose immune system is weak for other reasons (for example, chemotherapy and HIV patients) is said to be immune-compromised. The downside of immunosuppression is that with such a deactivated immune system, the body is very vulnerable to opportunistic infections, even those usually considered harmless. Also, prolonged use of immune-suppressants increases the risk of cancer. Therapeutic immunosuppression has very broad applications in clinical medicine, ranging from prevention and treatment of organ and bone marrow transplant rejection, management of various autoimmune disorders (e.g., rheumatoid arthritis), skin diseases, allergies and asthma. Whereas traditionally only a small repertoire of immunosuppressive agents was available for clinical use, recent discoveries have significantly increased the number of approved agents, resulting in numerous trials to further evaluate their potential. In addition, products of the biotechnology industry - monoclonal antibodies, cytokines, cytokine antagonists and other products of genetic engineering that target key molecular pathways in disease pathogenesis - have either already made, or are on the verge of making an important impact on treatment. The present book was planned bearing in mind the recent developments in this growing field. The book brings important developments both in the field of molecular mechanisms involved in Immunosuppression and active therapeutic approaches employed for immune suppression in various human disease conditions. Researchers have theorized that anti-inflammatory medications may help prevent diseases, such as coronary artery diseases (CAD), cardio vascular diseases (CVD), stroke, colon cancer and Alzheimer’s. Several recent findings from different laboratories in the world employing case-control human studies and/or specific animal models for chronic human diseases support these ideas. With the growing developments in stem cell culture and characterization technologies, there is considerable interest in the potential of cell-based therapies (particularly hematopoietic stem and dendritic cell therapy) of allo- and autoimmunity. Important recent advances in the immunotherapy of allergic diseases are also covered in this book. Gene therapy offers considerable promise for suppressing pathogenic processes in either transplantation or autoimmune disorders. The possibility of combining these important new advances to maximize benefit to the patient, and to minimize possible untoward effects (which are also given extensive coverage in this book), is one of the most exciting challenges of contemporary medicine. This volume is intended both for practicing physicians and surgeons and for biomedical scientists at the graduate/postdoctoral levels. It is designed to provide an insight into various theories behind these various approaches to immunosuppression and provide state-of-the-art reviews of current developments in each area. The contents of the book are organized into two sections: one delineating the current opinions in “Immunosuppression and Regulation of Immune Response” and the other dedicated to strategies adopted in “Transplantation and other Novel Therapies”. Each chapter is contributed by one or more experts in the field. There was a need to bring this information together in a single volume, as much of the key recent developments have been dispersed throughout the biomedical literature, largely in specialized journals. Since, as in the past, important developments in immunosuppressive therapy in one branch of medicine (i.e. transplantation) are likely to benefit another (e.g., dermatology, rheumatology, gastroenterology), cross-disciplinary coverage of the mechanistic basis of the various therapeutic strategies in a single volume is likely to convey the potential of advances in therapy in the most coherent manner possible. Hopefully, we will succeed in inducing interest and appreciation among the target readers about the potential for use of therapeutic immunosuppression in improving human life. We hope that the readers will enjoy participating in these advances in immunosuppression and its applications as I and my fellow authors have encountered in our careers. I would like to acknowledge the help and cooperation extended by all the experts contacted for their indispensable contribution to this book. At the same time I would like to acknowledge the support and editorial help provided by the staff of Intech, especially Ms Ivana Zec and Ms Ana Nikolic, who have done a marvelous job in preparing the layout of each chapter. Without their devoted and persistent help, this book would not have been a reality. I am indebted to one and all.